I have been a longtime reader of CensationalGirl. I love almost everything Kate does design wise. I have total house envy too - she had a beautiful home in California near wine country. But I digress, with my goal to be a bit healthier, I have been on the lookout for a smoothie recipe. I have been reading about green smoothies for awhile, but the thought of drinking something made entirely out of spinach or kale or celery just isn't appetizing to me. Then, just last week, Kate had a post about berry smoothies. 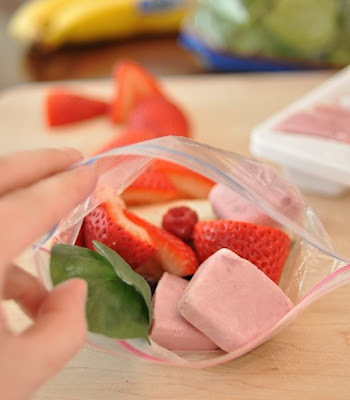 Even more appealing to me was the fact that she made little freezer packets so they are ready to make one at a time! So when Joe went food shopping last week, I had him get the necessary ingredients. Friday night I froze my yogurt in an ice cube tray and rationed out 6 spinach leaves, half a banana and the berries in little baggies. Of course my packets look a hot mess and nothing like Kate's. Looks good, but is something missing?? My blender had a hard time getting through the frozen banana. Perhaps I need to invest in a new one. I gave it a taste, and, well, I wasn't a huge fan. It tasted a little too sweet and gritty and I felt like I could taste more of the spinach than I should have. It took me until I was halfway done to realize I had completely forgotten to put in the frozen yogurt cubes. Fail. I dumped it back in the blender, and threw in a cube. Yes, that's a Mickey Mouse cube. Its the only ice cube tray we have in the house. First world problems: having an ice maker in the freezer means we have only one ice cube tray. Again, my blender had a hard time getting through the frozen yogurt. It felt like it was just mixing the frozen little ball around and not breaking it up. I finally got it somewhat blended and give it another try. JJ in his little hoodie photo bombing. Much, much better with the yogurt. It was pretty tasty. I think Joe was a little skeptical of the spinach so he didn't try it, but he is a smoothie lover and I think he would love it. Clearly, I didn't use the SuperFood powder Kate used - I wanted to make sure I actually liked it before I ordered the powder. Once I give it a try a couple more times, I might give the powder a whirl. My kitchen was a mess after I finally got it right. Berry juice was everywhere. Obviously it came from me going into and out of the blender 10 times, but I had to bleach my counters when I was done. Apparently I was supposed to mix the liquids first and then add the solids so perhaps that's why my blender had a hard time getting through the frozen stuff? Either way, does anyone have any recs for a new blender? I used frozen berries, and the 2 cups the recipe calls for used more than half the bag. It makes a big smoothie. I filled the glass in the pics to the top almost twice. Once I get through these initial packets, I think I am going to half the recipe for the next round. I think I am going to try and pull out a packet before I start my workout so it thaws up a bit, then blend it up when I am done. I will report back after I get the hang of it. In a blender, mix liquids (1/2 cup cranberry juice and 1/2 cup milk). 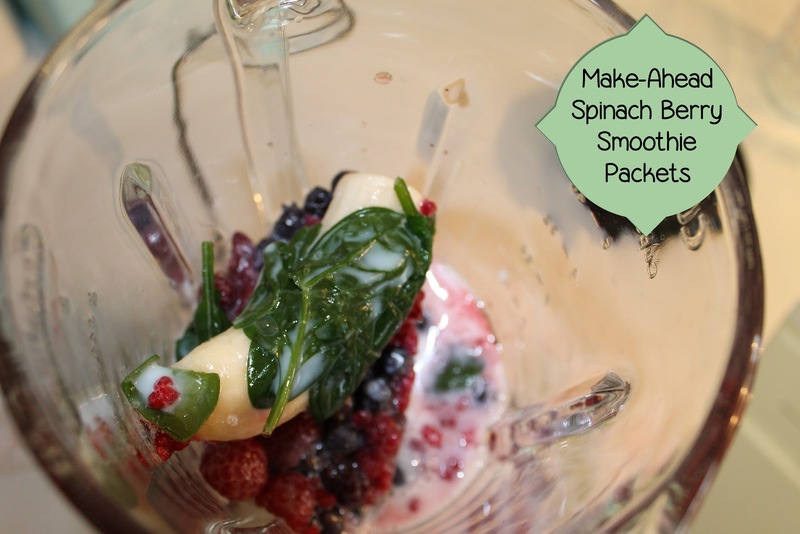 Add berries, yogurt, banana, spinach leaves, and SuperFood powder. Blend for a full minute on high until contents are thick and creamy. Add additional liquid or ice cubes or banana and berries to taste. *Green Berry SuperFood is made by Amazing Grass, and is available at Whole Foods, at the Amazing Grass website, and Amazon.